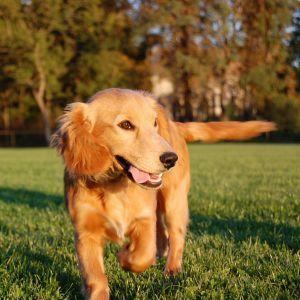 As summer approaches, thoughts turn to outdoor activities and fun in the sun for everyone, including family pets. Knowing how to protect your animal companions from the dangers of summer is the responsibility of every pet owner. Taking simple precautions and safeguards will help ensure your pets have a happy, fun-filled, safe summer. Overheating, resulting in heat exhaustion and possible heat stroke, can be deadly to your furry companion. Knowing the warning signs of these and what to do if your animal is in distress could save your pet's life. Immediately remove him from the heat and out of the sun. Cool your pet down with cool wet wash cloths or towels placed on its head and the pads of its feet. Never use ice or really cold water as they could cause the temperature to rise further by constricting the blood vessels. Offer your pet a drink of cool water but do not force it to drink. Even if the animal seems better, take it to its veterinarian right away to make sure that no internal damage occurred. Never leave your unattended pet in a car, even with the windows open. Limit the time that your pets are outside in hot weather. Limit your walks to the early morning or evening when pavement is cooler. Walking on hot pavement can cause burns or blisters to your pet's paw pads. Walking on hot sand at the beach can also cause paw pad blisters or burns. Never leave your pet unattended in a swimming pool. If you take your dog on a boat make sure it is wearing a well-fitted life preserver or vest. Many people use fertilizer and other chemicals on their lawns and in their gardens. Many of these items are highly toxic to animals if they are ingested. There are many plants and flowers that are poisonous to cats and dogs. The Humane Society of the United States offers a list of more than 700 plants that are potentially poisonous to pets. Many pets are attracted to the sweet taste of antifreeze that can leak from a car if it is overheated. Antifreeze is highly poisonous to children and animals. Keep a supply of cool water for your pet with you. Keep your pet safe in the vehicle by securing it in a pet car seat, a harness and seatbelt or in a crate. Never allow a dog to ride in the back of a pickup truck. This poses extreme danger to the dog, which can be thrown into traffic if the truck is involved in an accident or of the driver suddenly swerves or hits the brakes. Place the dog in the cab of the truck, either secured in a crate or wearing a harness and seat belt. If the dog must ride in the truck bed, secure it in a crate. When it comes to summer safety for animals, every pet caretaker must keep their animal companions as safe as possible.